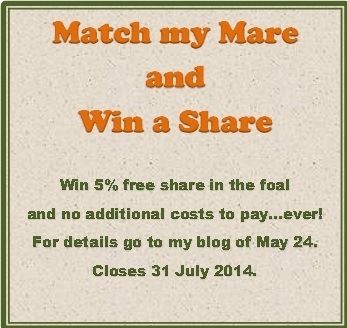 You still have time to put an entry into my “Match My Mare and Win A Share” competition. Carabella and Bettor Cover Lover. She has had a Bettor’s Delight filly (sold at yearling sale this year for $26,000) and is currently in foal to Shadow Play. Who should she go to next? That’s what I want you to tell me. You have no fees or costs to pay, and will get 5% of any earnings or any sale, whatever that might be. The competition is open to anyone, anywhere. Entry is free. I’d like more entries, and remember that I’m looking for thoughtful entries that explain why a particular sire is a great match for my mare The Blue Lotus. It may be reasons of pedigree, type, crosses of gold, commercial savvy, a mix, or something quite outside the square. There is no right answer. I’m judging this on the quality of the thought going into it. You can ask me additional questions about the mare and family if you want further information. Send your entries to me by email or by a comment on this or the original blog below, which explains the competition in more detail, although I have become relaxed about the length of entries so long as they are well written and interesting. What the competition is about, the rules and how to enter.